Guys I know it’s been a really long time, rumors of abandonment were rampant, but I’m happy to say leveL is not only alive, but I’ve got a bunch of exciting announcements for today’s relauch! LEVEL NOW UPDATES EVERY MONDAY WITH A NEW PAGE. Money has never been the name of the game with leveL, this is a passion project through and through. That being said, I’ve been asked frequently by readers for a way to support the comic and running the comic does come with some expenses. SO I feel like it makes a lot of sense and I really should have done this in the past. It’s a way for you to show you care for the comic, to help make bigger and better things happen, to get some nifty extra content AND to help tie me to the project even further. Everyone wins! If you feel like you want to support leveL please BECOME A PATRON OF LEVEL, any amount at all would mean so much! If Patreon isn’t your thing but you still have enjoyed an update you can do a one-time donation and BUY ME A COFFEE. I know I said one page a week but with it being such a big gap I wanted to do SOMETHING for the relauch so lucky readers, you actually get TWO pages for today’s update X) We rejoin Rain and Emory in the freshly unTiern sector they were trying to escape. Chaos is starting to take hold by Rain seems to have a plan that may or may not involve the return of an old favorite from the original comic. DUN DUN DUNNN! I’m excited to be back to these two and also to flesh out the Tiers a bit more with talk of the Transpor Tier. Fun fact, the guy that Rain bought the IDs off of in Chapter 2 was ALSO Transpor…clearly Rain knows what he’s doing and nothing will go wrong. Right? Well. I think that’s quite enough from me :) Please leave some comment love on these new pages. Man it’s good to be back. Excited!!! Happy new year, Nate. Omg I missed it so much! So happy to see you back! Me too T____T Happy to be here, happy new year!! Awesome! 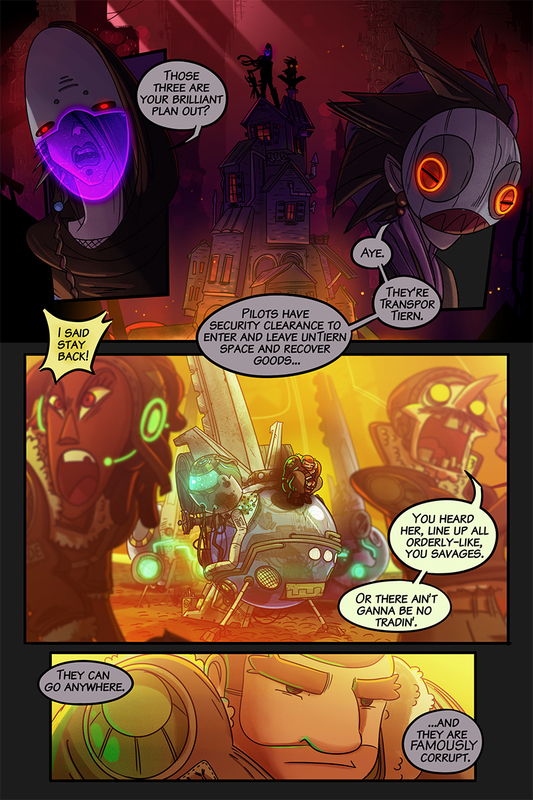 I’ve read many a webcomic, but this is the best, wow…. gah, you are too kiiinds :o <3 I'm glad you are enjoying it! !